If you have plenty of time and loads of patient then Angling or Fishing could be a very interesting sport for you. Fishing is an Eco-friendly sport which require great patient and lots of time. Interesting and unique tour , great fishing trip experience with local fisherman, enjoy adventure riding coracle boat, incl fantastic seafood on boat, exploring beautiful water palm coconut paradise. Fresh and dried fish and fish sauce (known as nuoc mam) are major ingredients of the Vietnamese diet, and fishing is an important occupation. Shrimp, lobster, and more than 50 commercial species of fish are found in Vietnamese waters. Ha Long Bay, the major fishing area of the north, is particularly rich in shrimp and crayfish. 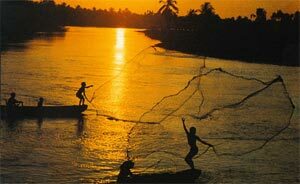 Fish also abound in Vietnam's rivers and canals. The fishing industry was severely depleted after the Vietnam war, when many fishermen (often overseas Chinese) fled the country. The government has increased marine production into a major export industry. In 2000, ocean production was estimated at 1,441,590 tons, and inland production was estimated at 161,000 tons. Exports of fish products were valued at $1,480 million in 2000. Vietnamese aquaculture primarily produces cyprinids and prawns. Among destinations over Vietnam , Nha Trang is always one of the most wanted selections. Being famous with crystal clear waters, Nha Trang is an ideal for snorkeling. A cruise to offshore islands and you can enjoy coral reefs under the sea. White sand dunes slope gently to the blue and clear water of the sea, inviting visitors to swim, play in the waves and discover the beauty of coral reefs with scuba diving. Tourists are also encouraged to try fishing, and in particular squid fishing. Fishing is an option both day and night; however squid fishing is only available at night. 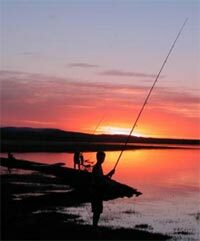 Services are available such as boat, fish rods and bait, as well as high-tech fishing equipment. There are many types of fish to catch and families and friends often gather together for seafood parties. Shark can be reached overland and boat, junk and canoe trips which can also be arranged from Con Son town center or Ben Dam Port to seven sceneries, Mui Dai Cape, big bamboo, and small bamboo islands, where visitors can indulge in the splendid island sceneries as well as freely drop their fishing rods and relax after a tiring work day. Our expert Guides know the good snorkeling spots, where to find places of interest. The guides do everything; set up the equipment, provide Snorkeling & instruction. Our Guides are all from Nha Trang, they offer local color and history that enhance your trip. Our tours offer an esthetic and ecological way to access all that Nature has to offer in Vietnam. Mountain Fishing: If you are a serious Angler we can take you on Fishing Expeditions into the mountains between Nha Trang and Dalat and into the Central Highlands. There are many rivers and lakes stocked with a wide variety of fish including the mighty Mekong Catfish, the biggest fresh water fish in the world. We can organize multi day expeditions to fish in these remote areas. Fly Fishing: We can teach you to Fly fish in the traditional Scottish Highland way:- Rod Set up, casting, landing fish etc. We have a stocked pond for to practice you newly learned skills and hopefully catch a fish by the fly!